Playing History 2—Slave Trade, which was released in 2013, bills itself as an educational game but came under fire last week when somebody noticed that it contained a " Slave Tetris" mini-game requiring players to pack as many tetromino-like slaves as possible into the hold of a ship. Naturally, that led to discussions about the appropriateness (or lack thereof) of using such sensitive subject matter as the basis for a game, especially as an element of "fun." 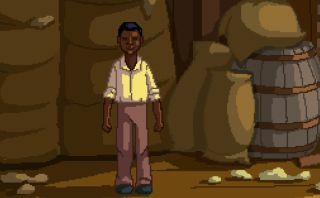 It's a topic that may well come up again following the release of I'm Joshua, a point-and-click adventure game about a young boy who was born into slavery in the early 1800s. I'm Joshua will feature an original story about an 11-year-old boy's fight for freedom, with "dozens" of characters to interact with, some trustworthy and some not. The plot will take different directions based on player choices, many of which will have to be made under pressure. "There are many cut scenes where you will really have to engage at a rapid rate," the I'm Joshua website says. "Timing is everything, and quite often you will need to make some truly tough decisions." The teaser actually looks pretty good, both as a setup for an adventure game and for the blunt, ugly way it begins: "One hundred and twenty-seven men were thrown overboard during the journey to the New World" is the sort of opening that suggests punches will not be pulled. But is it possible to make a "good" point-and-click adventure, or even one that stays reasonably true to the norms of the genre, based on a subject that's universally regarded as a horrific stain on US history? "Timing is everything," to me, doesn't feel like the sort of descriptor that belongs in a game that promises to take an appropriately sober look at the barbarity of the slave trade. I hope I'm wrong about that. I'm Joshua is being developed by Italian studio Dysotek, and will be released digitally in three parts. No launch date has been set, but more information is available at imjoshua.net.